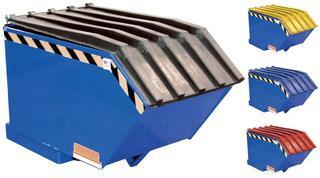 Formed base thickness is 1/4"
Blue baked-in powder-coated toughness with galvanized base. Keep the contents of hoppers out of sight for a cleaner appearance with Vestil's poly lids. Ideal for schools, hospitals, and warehouses. Constructed from heavy-duty virgin polyethylene material, these lids are lightweight and easy to open. The top of the lid includes a crown for water drainage and a ribbed design for strength and aesthetics. Factory installed when ordered with hopper. May also be easily field installed. Standard color is black.